Social media real-time coverage of the fire was extensive. 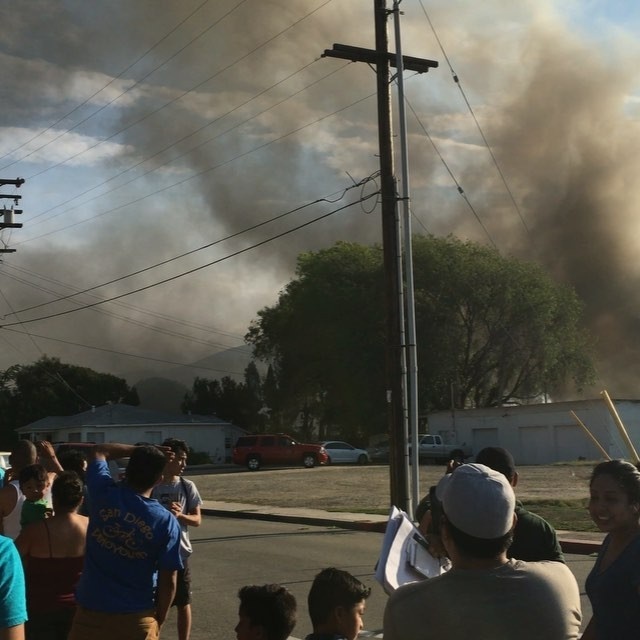 Holland RV Center on Travelers Way went up in smoke, and a whole lot of other stuff, with a 3-alarm conflagration around 4 p.m. Sunday that was seen all over San Marcos and the Highway 78 corridor. 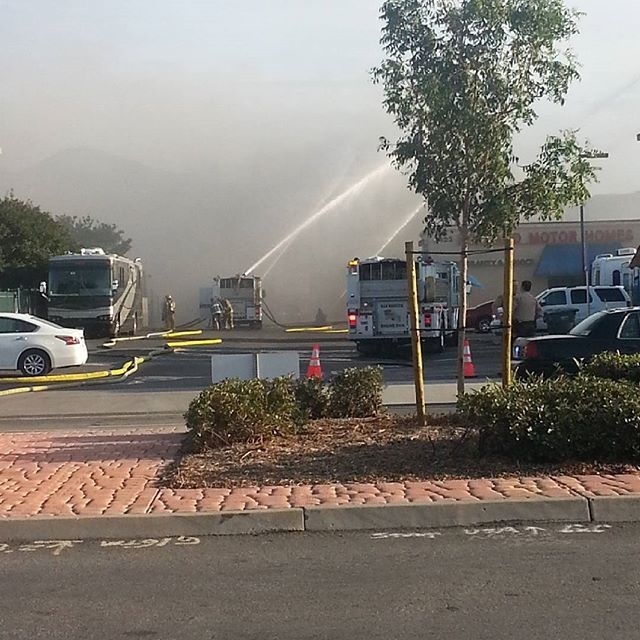 The fire enveloped the RV center and brought nearby Highway 78 traffic to a crawl, authorities said. West San Marcos Boulevard’s off-ramp was closed during the 90-minute incident. About 70 firefighters took more than an hour to put out the blaze. Due to spectacular smoke and prime location, and the advent of social media; accounts, videos and photos were posted throughout the Web adding a distinctly 2015 dimension to a classic firefighting tale. The new social media sharing site Banjo displayed around 25 real-time texts, photos and videos of the scene that can be found here: http://ban.jo/News/US-Canada/20151011/Large-Fire-Breaks-Out-In-San-Marcos-CA-San-Marcos/. This was anything but a quiet Sunday around the Valley of Discovery as smoke filled the sky shortly before 4 p.m. prompting more than 70 firefighters to beat back the giant blaze. San Marcos fire Chief Brett Van Wey said firefighters arrived to a scene featuring flames high up in the sky and immediately called for extra units. 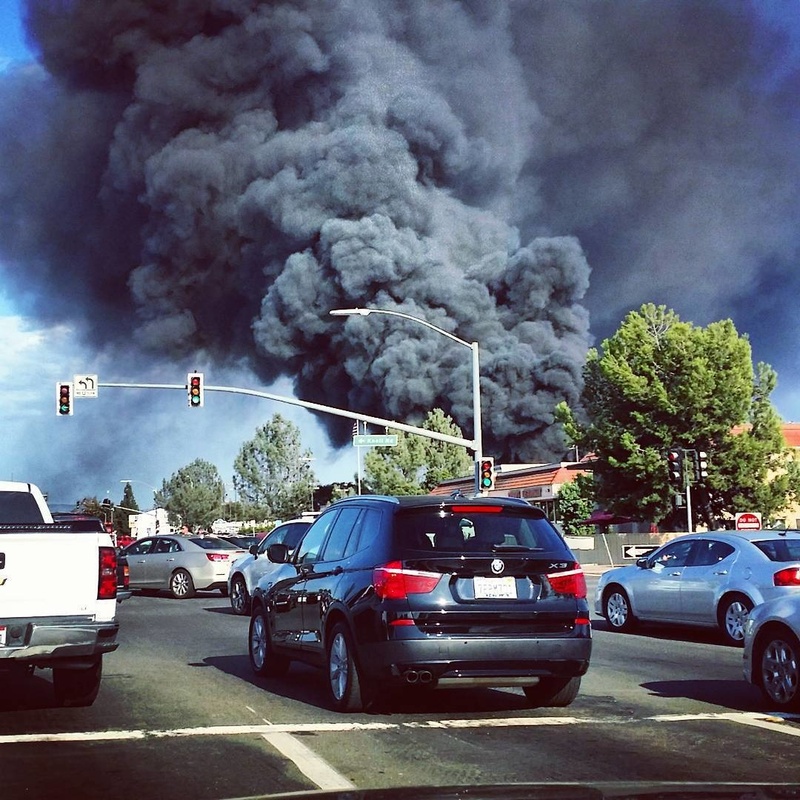 Smoke was visible throughout San Marcos and the Highway 78 corridor. Fire and smoke were bad enough, but what were believed to be propane tanks and other incendiary material went off inside the dealership service center, firefighters said. Van Wey said it wasn’t unusual for RV dealerships to have propane tanks around. 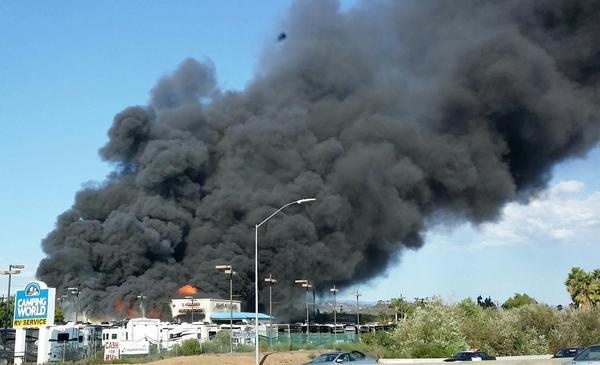 Camping World next door in the RV dealership section just off the freeway and San Marcos’ downtown escaped harm due to the efforts of firefighters who took an hour to put out the blaze, according to Van Wey. A damage assessment wasn’t immediately available. Authorities had not determined a cause and said the investigation was continuing. More than 25 videos and photos were aggregated by Banjo.com. Social media photo from the fire scene. It’s National Fluffernutter Day. Hooray?